9 July 2008, at 9:55a.m. 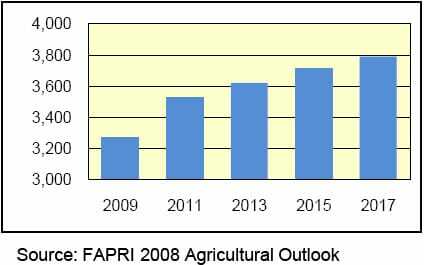 Broiler production is likely to increase by 6% in 2008, reflecting firm domestic and export demand for broilers. Turkey production is likely 11% higher in 2008. World demand for Brazilian broilers remains strong, especially in Europe, Saudi Arabia, the United Arab Emirates, Hong Kong and Japan. Producers are concerned about feed prices, even though Brazil’s 2007-08 corn and soybean crops are projected to break record levels. Brazil had a record production of 10.3 million metric tons (mmt) of broilers in 2007, up 10% from 2006. The 2008 estimate is 10.9 mmt, an increase of 6%. 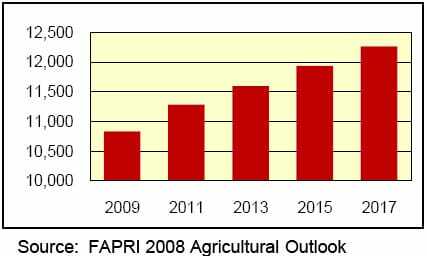 Broiler production stalled in 2006, in part due to the impact of avian influenza on world broiler consumption and a strong Brazilian currency. Turkey production rose 8% in 2007 and is projected to grow 11% in 2008. Poultry has a relatively high feed-to-meat conversion ratio compared to other meats, giving poultry a competitive advantage. 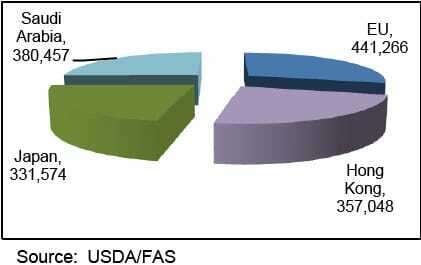 In Brazil, poultry accounts for about 40% of domestic corn consumption. Corn prices rose from R$25.02 per 60 kg in January 2007 to R& 33.80 in December 2007. High feed costs and a strong Brazilian currency against the U.S. dollar have squeezed profit margins. Corn production in 2007/08 is forecast at 55.25 (mmt) due to good yields and increased plantings because of strong world prices, and is expected to reach 56.6 mmt for 2008/09. Domestic broiler consumption is strong,growing from 7,200,000 mt in 2007 to a forecasted 7,680,000 mt in 2008. Domestic turkey consumption was 217,000 mt in 2007 and is forecast at 420,000 mt in 2008 year. 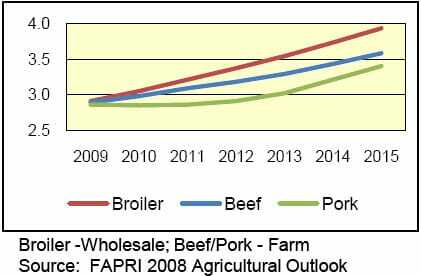 Broiler exports are projected to reach 3.2 million MT in 2008, up 10% compared to 2007. Turkey exports are projected to grow from 163,000 MT in 2007 to 180,000 MT in 2008, a 10% increase. Brazil’s poultry exports are expected to account for 38% of the global expansion in poultry trade in 2008. The value of Brazilian poultry exported as grown from $1, 216/MT in 2005 to $1, 675 in 2008. The European Union is Brazil’s major market destination for broilers and turkey. The EU created a quota for Thaiand Brazilian poultry imports after the WTO ruled against the EU’s tariff classification of salted chicken meat. Brazilis expected to fill its 2007/2008 tariff rate quota, and even over-quota exports to the EU could be profitable this year. Brazilian poultry meat exporters recently purchased several European poultry processors to guarantee stable and significant commercial outlets for Brazilian products in the EU.